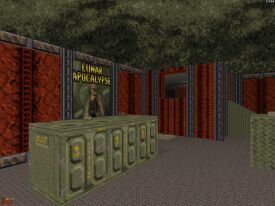 Atomic Bunker is MetHunter's second dukematch level. It's almost symmetrical - there's a central area where most of the action takes places and some routes leading to it. The level flows well: with two or three players it doesn't take more than a few seconds to spot another player or to get your hands on guns. There's plenty of health around (including a well placed Atomic Health) and a few neat spots for tripmine ambushes. Design is economical in that it servers gameplay but some extra detailing certainly wouldn't have hurt the level.